January 19 - 29, 2017. 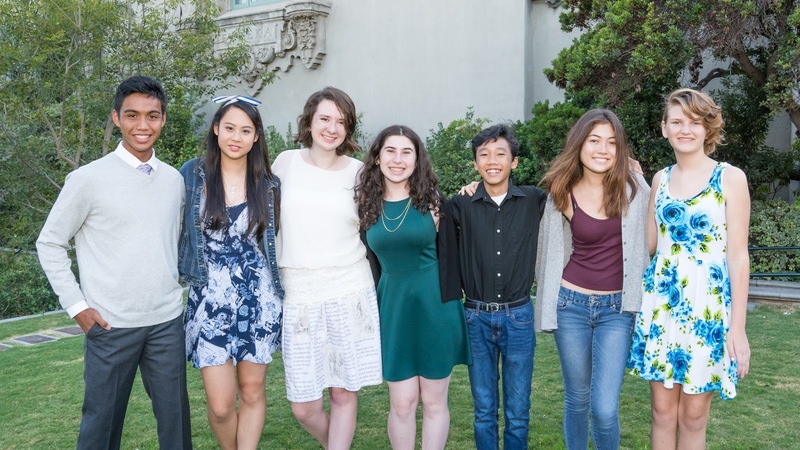 Sponsored by the Sheila and Jeffrey Lipinsky Family Fund, the festival will feature winning scripts from its California Young Playwrights Contest for ages 18 and under. Contest winners were selected from 385 plays submitted by students from across the state. Four scripts will receive full professional productions, and two scripts will receive staged readings in this highly regarded festival of new voices. All 385 contest submissions were evaluated blindly by the Ed Delos Reyes (Contest Coordinator) and a pool of theatre professionals who volunteered their time and expertise. The top 70 scripts were reviewed by Cecelia Kouma (Executive Producer), who worked with the Contest Coordinator to choose 16 finalists whose plays were evaluated by Final Judges. Final Judges in the selection process included Jennifer Thorn (Associate Artistic Director, MOXIE Theater), Danielle Ward (Literary Manager at the San Diego REPertory Theatre), Monique Gaffney (prominent local actor), and Ruff Yeager (prominent local actor/director/playwright/producer and adjunct instructor at Southwestern College). Yeager (who is also serving as Festival Artistic Director) and Kouma chose the final plays for the season based on the judges’ feedback and interviews of top finalists. The selection criteria focused on creative ideas, intriguing and authentic characters, fresh use of language, a story that is revealed through dialogue and action, and a script that would benefit from further development in the production process. 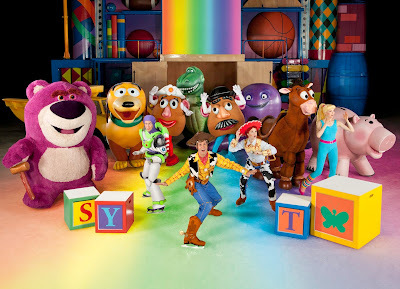 The Festival is divided into Program A (appropriate for ages 11+) and Program B (for ages 16+). Each program includes one staged reading and two full productions. Two acting ensembles will present the two different programs, with actors playing multiple roles. In Supermarket of Lost two teenagers and a young girl meet by chance in a mysterious warehouse where you can recover what you’ve lost in exchange for something of equal value. As their friendship develops, they discover a compelling difference between what we lose and what we choose to give away. 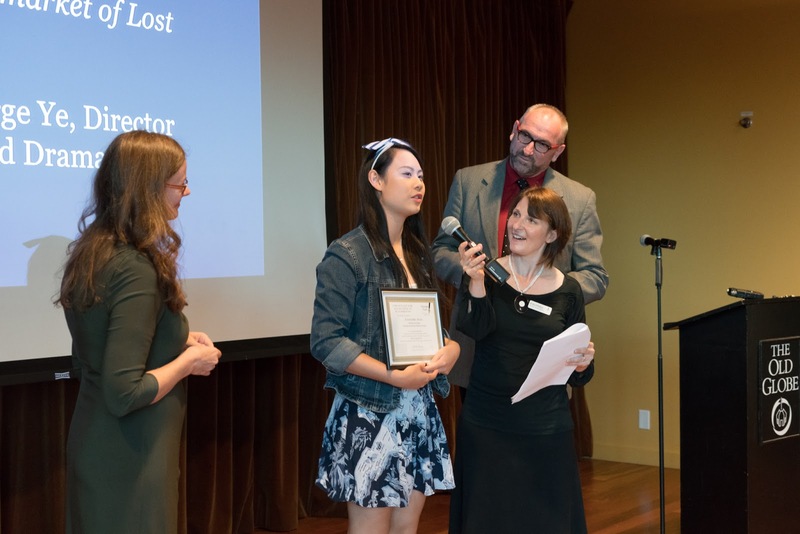 The play was written by Cassandra Hsiao, at age 16, while attending Orange County School of the Arts. Supermarket of Lost was originally produced in The Blank Theatre Young Playwrights Festival in Los Angeles, CA. George Yè will direct and dramaturg this thought provoking play. Cassandra Hsiao speaks about the inspiration for her play Supermarket of Lost. Set in Silicon Valley, the witty satire Hackathon examines issues of gentrification and bias in the tech industry, as teenagers from different walks of life compete to create an app that will change the world. When the names of the finalists were revealed to the producers, they were surprised and delighted to learn that Hackathon was written by 16 year old Eliana Salzer Dunn, who is the granddaughter of Playwrights Project’s Founder Deborah Salzer. Eliana attends City College of San Francisco; George Yè will direct and Mabelle Reynoso will dramaturg. Minh-Son Tran and Samantha Rafter, writers of A Play on Words with Arlene Gapusan. 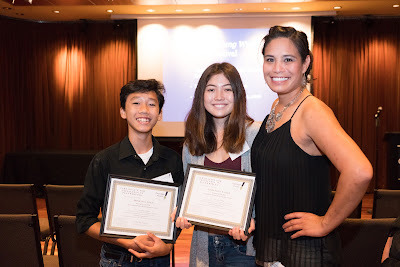 Minh-Son and Samantha wrote their winning play in Mrs. Gapusan’s class during a playwriting residency lead by Playwrights Project Teaching Artist Wendy Waddell. Beth Phillips, Playwrights Project’s Program Manager of School Programs, will direct Turtle on a Rock and Deborah Salzer will serve as the dramaturg/writing mentor. The Dumping Ground depicts the story of Mark, a high school student whose promposal is publicly rebuffed in front of his peers. 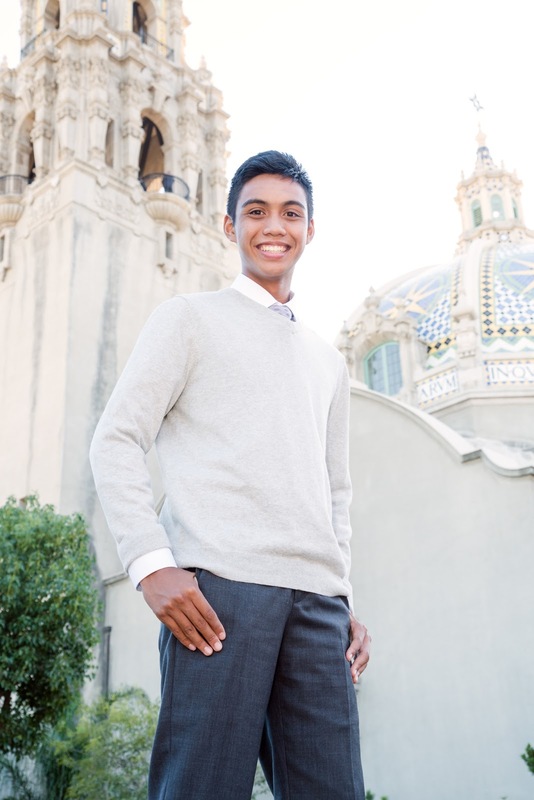 As he struggles to make sense of his rejection, he learns valuable life lessons from supportive mentors. Playwright Matthew Maceda attends Westview High School in Poway, and this is Matthew’s fifth play to win the contest. Three of his plays received staged readings and Coffee, Cream and Closure received a full production in 2015. The Dumping Ground will be directed by Wendy Maples, local theater educator and founder/Artistic Director of Step UP Theatre. Pros and Cons is a clever farce about formerly incarcerated friends who reunite for a fresh start as they reenter society. Despite their altruistic efforts, old habits die hard and whacky escapades ensue. 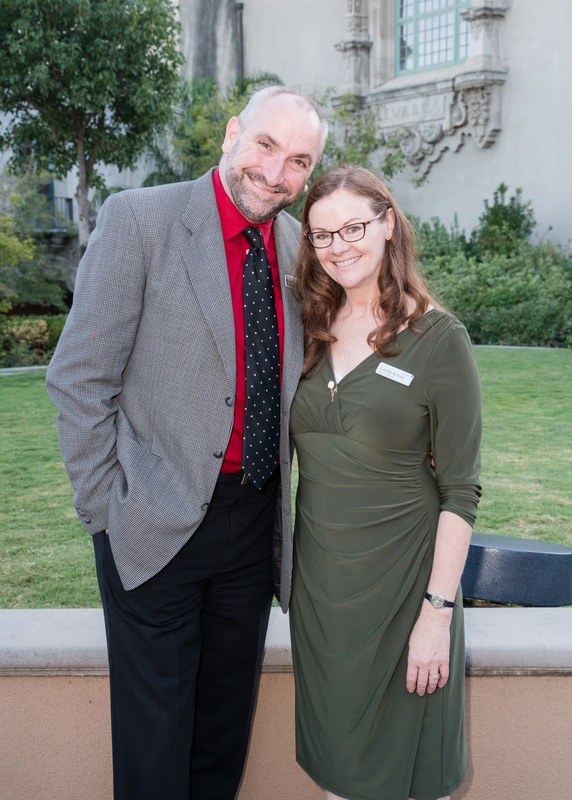 In the playwright’s words, “the road to comedy is paved with good intentions.” Katie Taylor, who penned the play, lives in Woodlake where she attends College of the Sequoias. Pros and Cons will be directed by Phil Johnson, and Ruff Yeager will dramaturg. A Play on Words by Samantha Rafter and Minh-Son Tran, introduces Patrick a piece of math homework, Patricia a pretty pencil, and Eileen an introverted eraser, as they experience an existential crises during Spring Break. 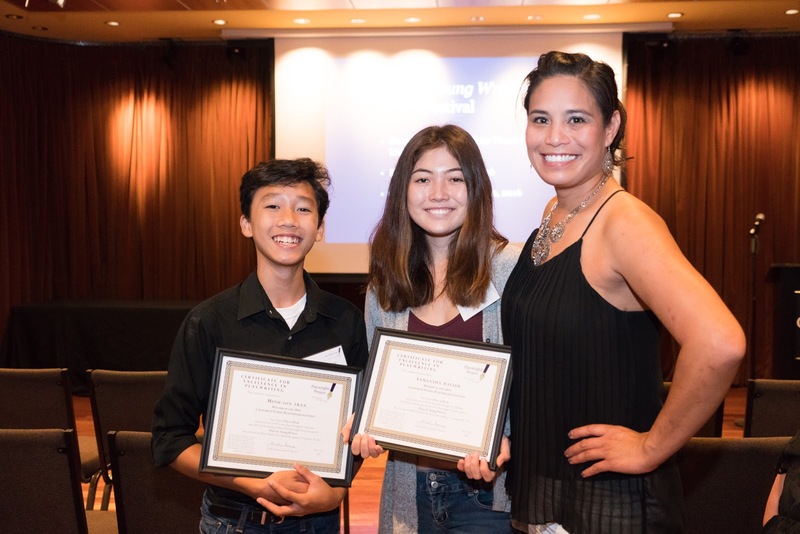 Samantha and Minh-Son wrote their winning script in a playwriting program at Black Mountain Middle School, which was taught by Teaching Artist Wendy Waddell in Ms. Gapusan’s Language Arts class. Playwrights Project Executive Director and Festival Executive Producer Cecelia Kouma with Festival Artistic Director Ruff Yeager.